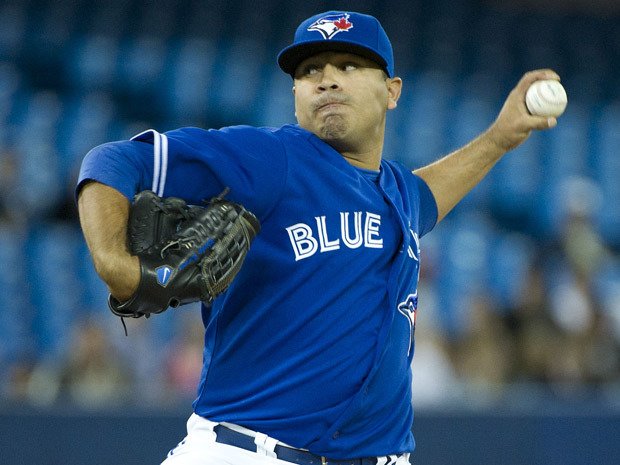 Ricky Romero’s start against the New York Mets could be a big opportunity for the Jays to get back into the winning ways many fans expect from the squad. STRADER: I would hate to say that Stephen Brunt stole my thunder, ‘cause really, he’s a messiah of sports writing, and I’m, well, a pretender. But he stole my thunder. I was going to write about how it’s time to see what John Farrell is made of. After Lawrie’s blow up (I don’t think doing it is right, and I certainly think it’s a suspension, but I’m willing to admit I would have thrown the helmet right at Miller…) it became clear to me that it is time for the Jays to calm down. They have too much power. And for all we know, they don’t face much retribution either, outside of a well-thrown beer. With the team facing five series in a row against winning clubs, I thought, oh man, this isn’t good. The first one is the Yankees, and it’s Drabek and Hutchison pitching. This could get ugly. So it was time for Bautista to take a bad call, for Escobar to stop waving at where he believes the running lane is, for Encarnacion to just get punched out. Shut up and play ball boys. You’re better than that. And then Drabek goes out and shows why he was such a highly touted prospect. Hello Yankees. Here’s my nasty sinker. Deal with it. 8-1, you have to be kidding me. A chance that this run against winning squads and first place squads could result in a turnaround for the record, and the standings. Bautista could keep hitting bombs. Tweaks to the lineup could continue to work out. This time, I think it falls on Romero. Hutchison is still so young, so inexperienced, that to expect a Yankee sweep tonight, a win from him – even though he gets lucky and draws Phil Hughes instead of the tilted hat killer – would be asinine. The Yanks are the Yanks. They’re resilient. A win by the Jays tonight, like so many things with this team this season, has to be considered gravy. But tomorrow Romero will go against the Mets. Romero has a chance to get this team back on a good train. Dominate, and open up the weekend for Morrow, Alvarez and Drabek again, who will more than likely give us a chance to win when they toe the rubber. There’s a chance tonight could be 9-1, but don’t listen to the happy voices today, who will immediately be angry voices again tomorrow if it is, set the brim of your cap low, remember that you’re Ricky Damn Romero, and attack. And then there’s a chance. I’m also emboldened by one other thing. Lawrie is appealing, and it will be heard by the league. I believe the league made a statement when they handed him four games. Ok kid, like the genius words of Chris Rock describing OJ Simpson, I wouldn’t have done it, but I understand. Now, with the appeal, they can make another statement. What Lawrie did was wrong. But take a game off of his appeal, and you’re also acknowledging that what Miller did was equally as wrong. Major League Baseball can’t punish umpires for bad calls. We can’t have replay for balls and strikes. Managers would begin arguing everything they disagreed with. It’s the nature of competition, and the human umpire is part of the beauty of baseball. But just like everyone who will scream for a guy to lose his job when he’s hitting .160, Miller didn’t do his job. I don’t care about code, or circumstance. His job is simple. He is to be an impartial judge to an entire game. No matter his personal feelings. Getting plunked is part of the code. But it has consequences. Not stealing a bag in a blowout is part of the code. Do it, and it has consequences. What Miller did was deliberate. It was intentional. I acknowledge as a fan of the game that umpires cannot be punished. But give Lawrie back one game, and there’s a chance Major League Baseball acknowledges, that they understand.